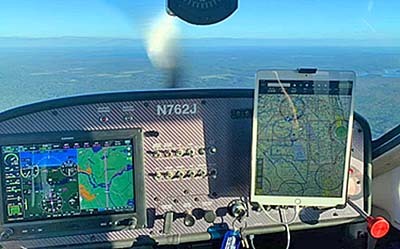 A view from Scott Severen’s Jabiru J-230D cockpit as he approaches DeLand Showcase 2018. Day One of the third running of DeLand Showcase is complete. As Videoman Dave and I scoured the show grounds looking for good stories, we spoke to a few vendors reporting that 2018 has been a good year. Our video news gathering exercise brought a pleasant discovery. Many companies are reporting a solid year of sales. The light aviation industry is composed of many small companies. None are corporations the size of Cessna or Cirrus so they don’t require hundreds of unit sales to break even. A U.S. importer delivering 20 aircraft can experience a good year from sales and other services they offer. When several companies report noteworthy sales success it suggests the market is healthy and customers are buying airplanes they want to enjoy. In parallel, the used LSA market also appears active and a virtuous circle begins to take form. The show itself enjoyed the great organization we have come to expect from director Jana Filip. She’s an impressive and experienced leader of these shows, backed up by her multi-talented husband Gary and a strong core of volunteers, many now with three years of experience in their logbooks. 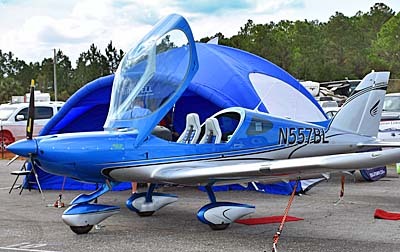 These sector-dominated shows — most vendors are in the light aircraft game though some display larger aircraft — usually have modest foot traffic. If you crave dense crowds, go to Oshkosh or Sun ‘n Fun and get in line for, well… everything. However, if you want face time with someone from whom you are considering an airplane purchase, DeLand and the other LSA shows have a clear edge. Icon Aircraft‘s production engine appears to be firing on all cylinders, according to Tampa Regional Sales Director Scott Rodenbeck. We heard about delivery numbers growing from five aircraft a month to 10 a month and a forecast for 15 shipments in December. These numbers will show up on our market share report based on N-number registrations. Increased production has reduced the delivery wait to only seven or eight months, down from literally years back when the California company was taking deposits left and right but not yet manufacturing. Bristell USA is having a banner year that should end close to 20 units sold for the deluxe and superbly equipped Bristell LSA, reported company leader Lou Mancuso and right hand man, John Rathmell. Beside delivering strong sales for Czech producer, Milan Bristela, Lou’s growing enterprise is also establishing a flight academy at the Sebring airport to offer younger pilots a lower cost path to careers as pilots. We will have video on this development. Duc Hélices is another company choosing Sebring for their operation, reported Michael Dederian, the company’s main face at airshows — after a few seasons nearly all producers know him. The popular French prop maker is opening a subsidiary in early 2019 to better serve U.S. customers. They plan to celebrate the American enterprise at the Sebring Sport Aviation Expo on January 25th. Van’s Aircraft made a big change this year. After bringing in ready-to-fly manufacturing to the world’s largest manufacturer of aircraft kits — the immensely popular RV line — Van’s is backed up for nearly a year, reported Atlanta-based, Vic Syracuse. That wait may come down as the company ramps up its new in-house production, but it’s clear RV-12 is a success story. 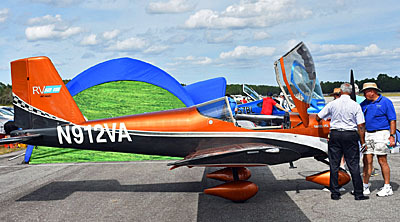 We recorded an interview with Vic about the new model, now known as RV-12iS. Yes, it uses the Rotax engine but that’s not all the changes in the renewed model. 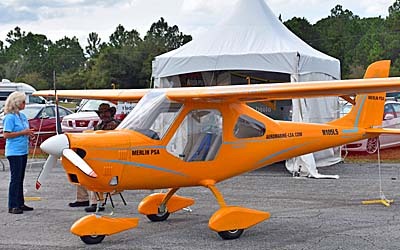 Chip Erwin of Aeromarine-LSA also reported growing sales for his well-priced, fast-assembling Merlin PSA (Personal Sport Aircraft). 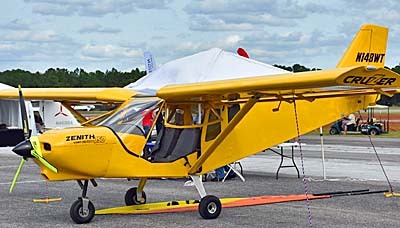 Besides sales to customers, he is using the single place aircraft for some government duties and these activities are keeping the Florida businessman on the move, literally, and from a business evaluation. We shot a video with Jay Kurtz of South Lakeland Airport (which many Sun ‘n Fun attendees know very well). After building 40 (yes, 40!) aircraft, his most recent project has been the Quick-Build Merlin. After just a single day, I’m excited to see what happens in two more days of the DeLand Showcase 2018. Look for another report tomorrow. Filed Under: Aeromarine-LSA, Bristell Aircraft (USA), BRM Aero, s.r.o., BRP-Powertrain (Rotax Aircraft Engines), Continental Motors, Duc Hélices (props), Icon Aircraft, Jabiru USA (North America), Splog, Van's Aircraft, Inc.
How is Vashon Aircraft doing? Hi WT: Vashon has reported more deliveries and all indications are that they are doing well. I will dig around and see what news I might uncover. The company did not attend DeLand or Midwest before that, but perhaps they will show at Sun ‘n Fun. It is a mighty long flight from the Northwest U.S.